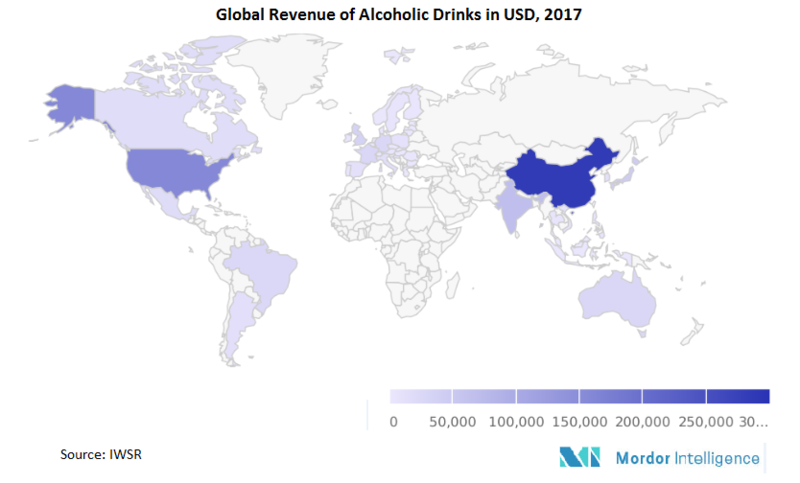 The global alcoholic drinks packaging market was valued at USD 27.06 billion in 2017 and is expected to reach a market value of USD 36.38 billion by 2023, registering a CAGR of 5.06% during 2018-2023. Alcoholic drinks consumption is expected to increase in the forecast period, directly influencing the alcoholic drinks packaging market. The type of products considered under the scope of study are bottles, metal cans, cartons, and pouches. The market is also segmented by material used, such as plastic, paper, metal, and glass. The increase in consumer spending ability on recreational activities and growth in social acceptance have led to a sustained increase in the demand for alcoholic drink products, which influence the packaging market. Packaging has played an important role, with the wide range of offerings by alcoholic drink manufacturers, in turn contributing to the market growth. Major innovations in alcoholic drink packaging to attract consumers are exhibiting significant impact on the market. Consumers are gravitating towards unique alcoholic products, which offer an interesting experience. With the number of breweries increasing and an exponential number of new beer options available, competition between companies is increasingly fierce, making differentiation the key to success. Innovative packaging is a highly important strategy to attract consumers and stand out in crowded retail space. According to a survey, it was estimated that 65% of the consumers pick up a product, based on its packaging design. Packaging and branding is a topic, which is evolving, and many suppliers are extending and launching their current brands in this space. For instance, wine producer E&J Gallo launched “Naked Grape” in the 3L box category of wine, and is enjoying success. Numerous brands have been experimenting with innovative packaging solutions, to stand out on the store shelf. For instance, Sofia brand sells wine in pink cans, and Bandit brand packages its wine in small, sustainable 500 ml and one-liter cartons. The rise in consumption of alcohol in adults is showing a severe impact on innovations in the alcoholic packaging market. Furthermore, millennials are adopting wine at a faster rate than any other generation. They are estimated to have low brand loyalty, because they love to experiment distinct-tasting wines from various regions, in different packaging, which appeals greatly to their sense of adventure. Consumers are receiving PET wine bottles positively, as the bottles are unbreakable and easier to carry, making them exceptional for cottages, parties and outdoor events. Moreover, consumers appreciate the environmental benefits, which are further favoring innovations in the packaging. The glass bottle packaging of alcoholic drinks is one of the major segments of the bottled packaging market. However, the demand for pouches and cans has been increasing over the past few years. The market is driven by various innovations and researches in bottle packaging. New trends in packaging size and packaging design are expected to continue attracting consumers. Alongside pack shaping, pack size, closure type, design, and the use of thermochromic ink, are the other factors contributing to the development of alcoholic bottle packaging. For instance, Coors beer uses thermochromic ink on glass bottles to indicate that the beer is cold enough to drink. The increase in plastic bottle recycling rate is also driving the plastic packaging market for alcoholic beverages. For example, according to the Canadian Plastic Industry Association (CPIA), in 2015, at least 320 million kilograms of post-consumer plastics were collected for recycling. HDPE bottles and plastic bags constitute the major share in plastic recycling. The rise in consumption of beer is yet another factor that affects the alcoholic bottle packaging market. Further, the increase in the heavy-drinking percentage, majorly in adult age group, is expected to boost the alcoholic bottle packaging market. Wine is one of the Most Popular Drinks, having a Significant Share in Alcoholic Packaging Market. There is high demand for various global brands of wine. Wines from France and Italy are especially popular. Global wine consumption experienced a stable growth from 2011 to 2016, with particularly a strong demand for wines labeled as VQA. These labeled wines indicated a growth of more than double of the total wine sale in 2015. Moreover, sparkling wines are experiencing a significant growth. Consumers are moving away from traditional champagne to try new sparkling varieties, such as Prosecco. Especially, the young consumers are moving toward sweet wines. August 2017 - Smith & Sinclair launched new designs for alcoholic pastilles. All packaging featurenew artwork that is influenced by the molecular composition of each alcoholic spirit, which is used in Smith & Sinclair’s creations. Each pastille will be individually wrapped in pick ‘n’ mix-inspired single serves, which will also be available in premium gift boxes of 8 and 16. Major Players: Amcor Ltd, Mondi PLC, Ball Corporation, Rexam PLC, Saint Gobain SA, Tetra Laval, Crown Holdings Incorporated, Sidel, Krones AG, and Bemis Company, Inc.